A British man was sentenced to life in prison on Friday over a plot to kill Prime Minister Theresa May by first detonating an explosive device to get into her Downing Street office and then using a knife or a gun to attack her. Crimes or incidents that are classified as ‘online’ occurred on social media platforms such as Facebook or Twitter, or on other Internet-based platforms, were verified as having happened within the UK, and account for a third of reports in 2017 (n=362), which represents a 16.3% rise in reports when compared with the previous year (n=311). This small rise can be partially attributed to the way in which ideologically-motivated accounts felt emboldened by major trigger events, (such as terrorist attacks) and broader Islamophobic discourses in the public sphere. 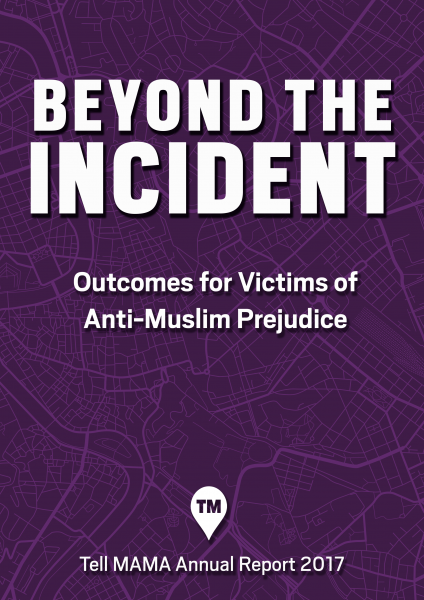 The ‘online hate’ figure, however, should be viewed as part of a wider trend in our data sets where there has been a marked shift towards more serious offline incidents such as physical attacks, threatening behaviour and abuse more generally, along with a growing awareness of Tell MAMA in Muslim communities, among key stakeholders, and partners, resulting in a greater willingness amongst victims and witnesses to report. For further information about Tell MAMA please click here. Nottinghamshire Police are investigating an Islamophobic incident at a fitness club after a man ranted that a Muslim woman near him was going to ‘bomb’ and ‘kill him’. The incident occurred on May 31, at a branch of the David Lloyd fitness club chain in the East Midlands. Speaking to Tell MAMA, the Muslim woman, who wishes to remain anonymous, stated that upon entering the steam room, she heard a man loudly tell another club member: “She was smiling at me, another f**king Muslim, she thinks I’m going to smile back at her, this f**king Muslim, she’s going to bomb me, she’s going to kill me”. She added that she had smiled at the man before entering the room. The man also made other remarks, including that he had ‘no respect’ for Muslims before exiting the room. Some academics, like Dr Chris Allen, speak of how the hijab functions as a ‘universal symbol’ of “Muslimness” yet with no visible Islamic clothing the woman was targeted due to her ethnicity, which again demonstrates the role of racialisation in broader anti-Muslim and Islamophobic discourses. The comments left her feeling vulnerable, unsafe, distressed, and humiliated. She worries about bumping into the same man when accessing certain facilities at the club. She complained to management but is concerned about their slow response. Tell MAMA has now written to the fitness club on her behalf regarding her complaint. She described the perpetrator as being male, white, in his 60s or 70s. In 2017, the single biggest incident category recorded by Tell MAMA was abusive behaviour, where 52 per cent of offline reports constituted verbal or non-verbal forms of abuse. The post Pensioner loudly ranted about ‘another f**king Muslim’ smiling at him appeared first on TELL MAMA. Punjab’s new information minister, Islamist politician Fayaz-ul-Hasan Chohan, has announced a ban on “vulgar” movie billboards in the Pakistani province, angering those who fear the growing influence of hardliners under new Prime Minister Imran Khan. Khan’s election victory in July was helped by strong support from Islamist parties. Chohan joined Khan’s Pakistan Tehreek-e-Insaf Justice Movement from the Islamist party Jamaat-e-Islami Pakistan. The Zion Church in Beijing, one of the city’s largest unofficial Protestant “house” churches, has operated with relative freedom for years, hosting hundreds of worshippers every weekend in an expansive, specially renovated hall in north Beijing. The Vatican and Beijing are locked in talks to resolve a decades-long dispute over appointing bishops in China that, if resolved, could make underground Catholic churches official, with Holy See-approved bishops. Wang Yu, a prominent rights lawyer who has defended Christians from harassment and was recently baptised at Zion after years of worship there, said she believes the pressure on believers is an attempt to force the church to close. The new regulations have increased government pressure on the churches to “sinicize” – to be culturally Chinese and submit to oversight from the Communist Party – but many have resisted, saying this would be a fundamental betrayal of their faith. The post China: CCTV cameras and eviction for a ‘house church’ in Beijing appeared first on Faith Matters. Jordan said on Thursday it would lead a campaign to raise funds for the U.N. agency that supports Palestinian refugees, to help it survive after the United States cut its funding. Foreign Minister Ayman Safadi said a meeting next month in New York on the sidelines of the U.N. General Assembly would mobilise support for the United Nations Relief and Works Agency (UNRWA) to continue core education and health services. Social media, including Facebook, must proactively block content inciting hatred and prevent online campaigns which target minorities, such as those undertaken in Myanmar, the United Nations human rights chief said on Wednesday. Trump’s attack against the Alphabet Inc. unit follows a string of grievances against technology companies, including Twitter Inc and Facebook, which he has accused of silencing conservative voices. Skulls and other remains of massacred tribespeople used in the colonial era for experiments to push claims of European racial superiority were handed over by Germany to Namibia at a church ceremony in Berlin. “Today, we want to do what should have been done many years ago – to give back to their descendants the remains of people who became victims of the first genocide of the 20th century,” said Petra Bosse-Huber, a German Protestant bishop.